The tape used is in this machine is a proprietary video cassette format( similar to the old Sony beta Tape for video) which uses a 1/2" audio tape. Apparently the actual tape is TDK-SA, chrome Type II high bias, 70 uS eq. Other people around the web say that you can re load these with Quantegy 456 but when you try to actually find someone that has and possibly a review of the performance, well I came to a dead end. "As far as Quantegy 456 if it’s the same as Ampex 456 - the overall sound isn’t bad if recording composite music; like from radio or CD, but if recording individual tracks of instruments, the freq response is way off and cannot be biased properly for this tape. The original tape was TDK-SA, chrome Type II high bias, 70 uS eq". .Apparently the tape is a Cobalt formula. 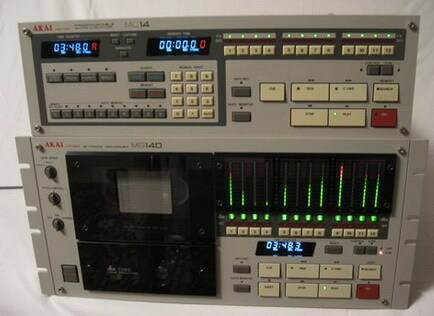 The original tapes which are no longer made ( Akai MK-20J) are rare and very rarely come up for sale especially new.